Last month, we talked a lot about women’s hormones: what they are and how they function, what happens when they don’t play nice, and how to balance hormones naturally. … need I go on??? If any of these sound familiar, you’re not alone. Us women battle so much that goes against the health of our hormones, and we have to take measures to keep our hormones happy or we end up with hormonal imbalances that lead to all sorts of problems. While hormones naturally fluctuate based on the time of month or stage of life we’re in, they can become truly imbalanced due to a number of reasons. We discuss those reasons more in depth here, where we also discuss how to balance hormones naturally. The main causes of hormonal imbalances are endocrine-disrupting chemicals in our cleaning supplies, personal care and beauty products, and food, as well as poor lifestyle choices like lack of sleep and chronic stress. As we’ve discussed a number of times, diet is paramount to balanced hormones. Good fats are one of the best sources of healthy-hormone-building nutrients, which is why I created this DIY supplement with good fat from coconut milk. The supplement also contains collagen, which is made up of amino acids- another building block of healthy hormones. I’ve told you about how I use juicing to help support liver health, but did you know with the right ingredients, juicing is also great for hormone health? I’ve created a juice recipe that contains lots of great hormone-supporting nutrients. Fresh orange juice- your adrenal glands (which are a major player in the hormonal system of your body), both regulate and depend on hormones. They also use the highest concentration of vitamin C out of all your body functions. 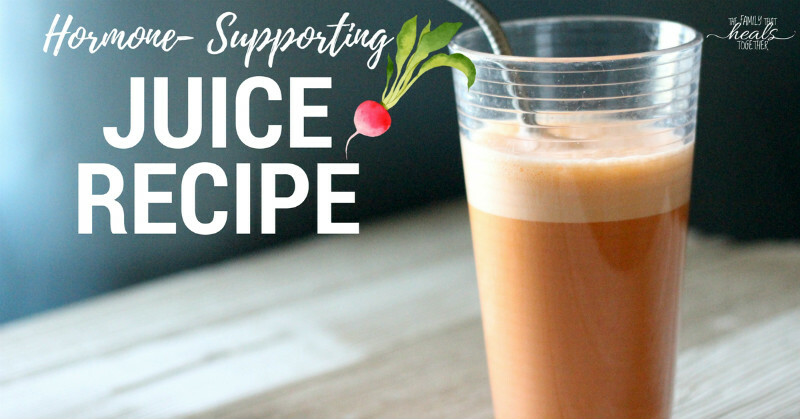 Juicing oranges is a great way to support the adrenals, and your hormones, with a hit of fresh, bioavailable vitamin c.
Beets- beets are a nutritional powerhouse, best known for supporting the liver and cleansing the blood. Beets are rich in iron, b vitamins, potassium, magnesium, and folate. Because they are such a good liver support, they help usher toxins (like excess estrogen!) out of the liver. Greens- like beets, greens are rich in vitamins and minerals, namely folate and vitamins C and A. They also help to support and cleanse the liver and bowels, clearing excess toxins that interrupt hormones. It’s best if your produce is organic, as the toxins found in pesticides used on conventional produce are hard on the liver and may be counterproductive to your goals. Raw egg yolk- make sure it comes from pastured, healthy hens. This is incredibly helpful for the liver and a good source of good fat and other nutrients like selenium and choline, which are both excellent for brain and emotional health. A raw egg yolk a day keeps the doctor away! 2 tablespoons grassfed cream- it’s best if you can find raw cream fresh from a local farmer, but if you can’t, look for organic, grassfed cream. The ones I’ve found contain a gum thickener, and, until I can get my hands on raw cream again, I’m ok with that. Cream is a rich source of good, hormone-supporting fats. To improve digestion and impart probiotic benefits, try turning your cream into creme fraiche. Blend gently and drink right away, as the nutrients in juice begin to decline quickly. 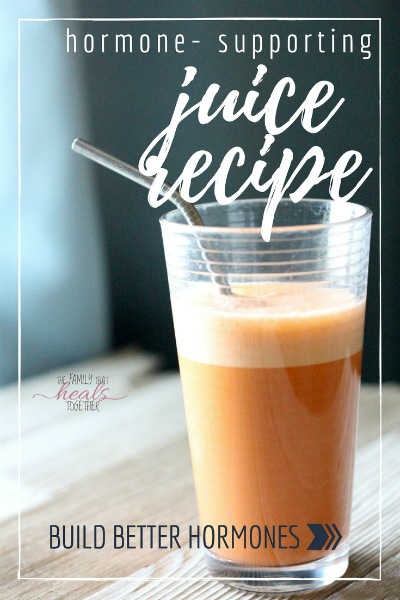 I love learning how to balance hormones through easy nutrition hacks like this juice. It’s a relatively inexpensive, simple way to flood my body with the nutrients my hormones crave. I know for certain that I feel so much better when I commit to taking the time to juice every morning. I have better energy, better emotional health, and fewer episodes of pain and fatigue. Have you learned any great hacks for balancing hormones? Share in the comments, then share this post using one of our links!